Join us for The Legends & Legacies Gala. 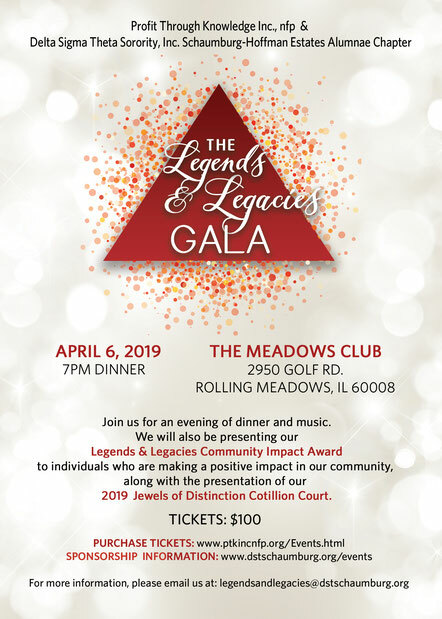 This exciting event will be held on Saturday, April 6, 2019 at The Meadows Club in Rolling Meadows, IL. The Legends & Legacies Gala is an opportunity for you to "party for a purpose," as this event was designed to raise funds for youth enrichment programs and scholarships. We hope that you'll join us for an evening of dinner & music. We will also be presenting our Legends & Legacies Community Impact Award to individuals who are making a positive impact in our community, along with the presentation of our Jewels of Distinction Cotillion Court.